Colonel Gerrit G. Lansing [brother of Sanders Lansing and John Lansing] fought at the Seige of Yorktown. Major General Lafayette was in charge of two brigades, the 2nd commanded by Brig.Gen. Moses Hazen. Two of Hazen's batallions were headed by Lt. Col. Alexander Hamilton and Lt. Col. Edward Antill. Lansing served as a Lieutenant under Hamilton. Col. Lansing married Mary Antill, the daughter of Col. Antill. When Antill's wife Charlotte died soon after the birth of their daughter Frances, Col. Antill returned to Canada, leaving Frances with the family of Col. Hamilton. 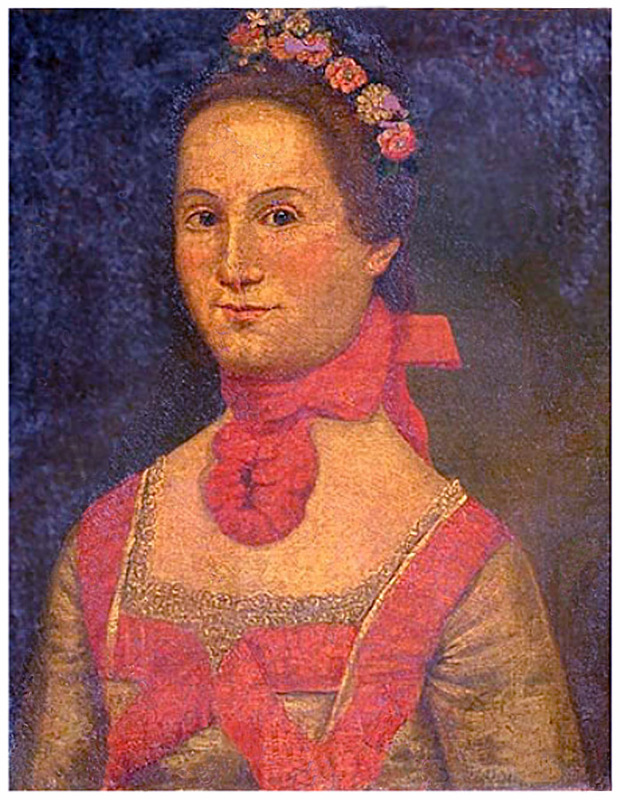 Frances Antill was married out of the home of Col. Lansing and Mary Antill Lansing to Arthur Tappan, a co-founder with his brother of the Anti-Slavery Society. Col. Lansing's son, Barent Bleecker Lansing, married Sarah Breese, the daughter of Arthur Breese. During Lafayette's visit to America in 1825, Lafayette was entertained by both Col. Lansing and Arthur Breese, as well as by the uncle of Arthur Breese's wife, Col. Henry Alexander Livingston. 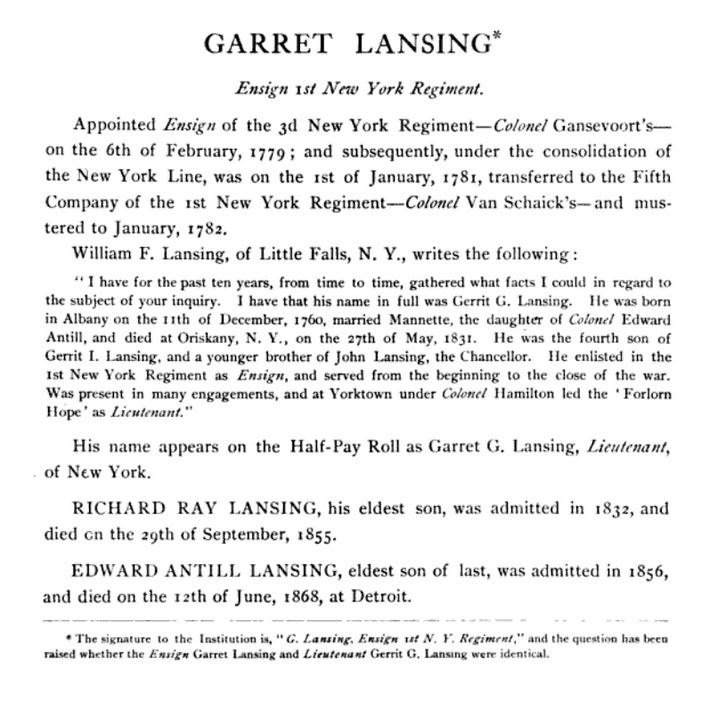 On January 30, 1754, John TenEyck Lansing [brother of Gerrit G. Lansing and John Lansing] was born in Albany, NY, to Gerrit Jacob and Jannetje [Waters] Lansing. At age 21 Lansing had completed his study of the law and was admitted to practice. In 1781 he married Cornelia Ray. They had 10 children, 5 of whom died in infancy. Lansing was quite wealthy; he owned a large estate at Lansingburg and had a lucrative law practice. From 1776 to 1777 Lansing acted as military secretary to Gen. Philip Schuyler. From the military world Lansing turned to the political and served six terms in the New York Assembly--1780-84, 1786, and 1788. During the last two terms he was speaker of the assembly. In the 2-year gap between his first four terms in the assembly and the fifth, Lansing sat in the Confederation Congress. He rounded out his public service by serving as Albany's mayor between 1786 and 1790. Lansing went to Philadelphia as part of the New York delegation to the Constitutional Convention. As the convention progressed, Lansing became disillusioned because he believed it was exceeding its instructions. Lansing believed the delegates had gathered together simply to amend the Articles of Confederation and was dismayed at the movement to write an entirely new constitution. After 6 weeks, John Lansing and fellow New York delegate Robert Yates left the convention and explained their departure in a joint letter to New York Governor George Clinton. They stated that they opposed any system that would consolidate the United States into one government, and they had understood that the convention would not consider any such consolidation. Furthermore, warned Lansing and Yates, the kind of government recommended by the convention could not "afford that security to equal and permanent liberty which we wished to make an invariable object of our pursuit." In 1788, as a member of the New York ratifying convention, Lansing again vigorously opposed the Constitution. Under the new federal government Lansing pursued a long judicial career. In 1790 he began an 11-year term on the supreme court of New York; from 1798 until 1801 he served as its chief justice. Between 1801 and 1814 Lansing was chancellor of the state. Retirement from that post did not slow him down; in 1817 he accepted an appointment as a regent of the University of the State of New York. Lansing's death was the most mysterious of all the delegates to the Constitutional Convention. While on a visit to New York City in 1829, he left his hotel to post some letters. No trace of him was ever found, and it was supposed that he had been murdered. Barent B. Lansing, was a native of Herkimer connty, NY. Barent Bleecker, was born at Oriskany, N. Y., in the year 1793, and in the year 1815 married Sarah, daughter of Arthur Breese, esq. At an early age he was clerk for William G. Tracy, esq., at Whitesboro, and after that engaged in business with James Platt, esq., of Utica, N. Y. 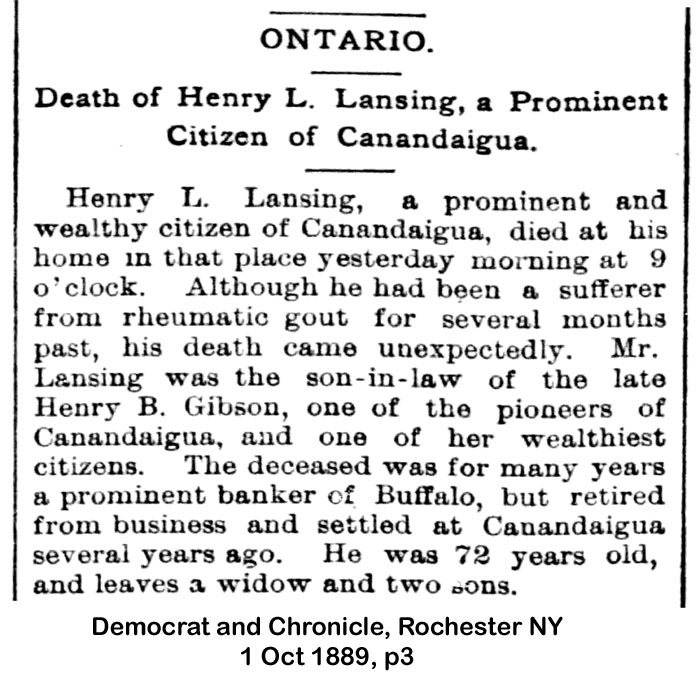 This partnership lasted only a short time and subsequently Mr. Lansing accepted an offer and became cashier of the Bank of Belleville, N. J., and from there he was called to the cashiership of the Oneida Bank, Utica, which place he held until his death in 1853. Mr. Lansing died at the house of his daughter, Mrs. Charles W. Morse, the wife of the eldest son of Prof. S. F. B. Morse, at Brooklyn. His remains were taken to Utica for interment and were buried from the Presbyterian Church. The stores were generally closed on the day of his funeral as a voluntary tribute of respect for one who had many friends and no enemies. Mr. Lansing had a loving and affectionate nature and was distinguished for honesty and truthfulness. Henry Livingston Lansing [the son of Barent Bleecker Lansing], was born in Rome, N. Y., in the year 1818. He was educated for a business career, and on leaving school engaged in the mercantile business at Utica. In 1836 he accepted an offer of a clerkship in the Ontario Bank at Canandaigua, N. Y., an institution in which his paternal and maternal grandfathers were large stockholders, and in the year 1838 married Catherine Olivia, daughter of Henry B. Gibson, cashier and manager of that bank. 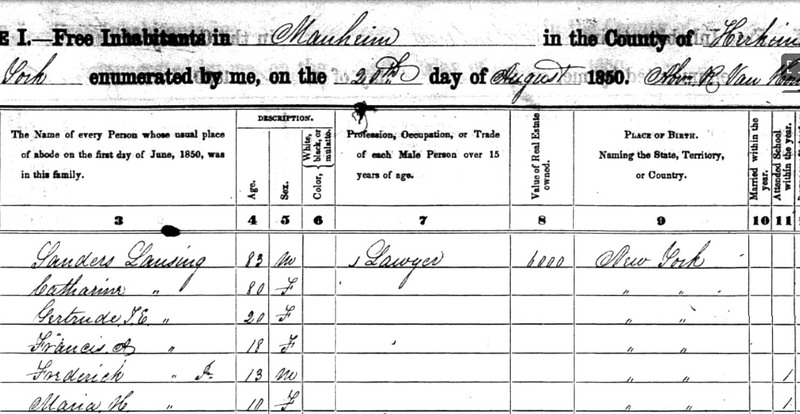 Mr. Lansing remained in the bank with his father-in-law for a number of years, and then went with his family to Detroit, Mich., where he accepted the cashiership of the bank called "The Michigan Insurance." Remaining only a year or so in this bank Mr. Lansing was called to the cashiership of the Oliver Lee & Company Bank, Buffalo, N. Y., which institution he remained in as cashier, and afterwards as president, until the bank was forced, in the great panic of 1857, to shut its doors. Some time after the failure of the bank, Mr. Lansing accepted the office of treasurer and secretary of the Buffalo and Erie Railroad, with its office at Buffalo. This position he held for a number of years, filling the ofhce with great acceptability to the directors of the company. 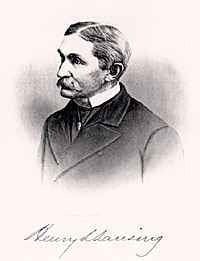 Resigning his office, Mr. Lansing, about the year 1873, purchased a charming country place at Niagara, Ontario, and there he passed his summers until the time of his death in 1889. A member of New York's Military Association, he rose to the rank of Brigadier General of the 31st New York Militia during the Civil War. Mr. Lansing was essentially. a domestic man, he was fond of his home and devoted to his family. He was ever led to seek the highest happiness in his own domestic circle and possessed in a high degree those social qualities which belong to the refined and cultured gentleman. In a certain sense Mr. Lansing was the fruit of hereditary culture his father and grandfather on the paternal and materna1 side were bon vivants and connoisseurs. He prided himself upon his accurate judgment and discrimination in the choice of and selection of fine wines, and was an epicure in the best sense of the word, a lover of life's good things. In one particular, in which business men are too generally negligent, Mr. Lansing excelled; he had cultivated the art of letter writing until his epistolary style became of rare excellence. He could express himself in the readiest and neatest way with great apparent ease, his letters were bubbling over in sentiment, expressed with great felicity and beauty, as all who ever received them will bear testimony. Mr. Lansing was extremely fond of the sylvan sports, was an exceedingly good shot and an expert fisherman. In the years gone by, in order to indulge in the latter sport, he was compelled to make his own flies, and it was that accomplished gentleman and skillful sportsman, Alexander Jeffrey of Lexington, Ky., but who at that time lived in Canadaigua, who taught him how to make and use them, and it was this same gentleman who taught Seth Green, of Rochester, N.Y., who became the State's most expert fisherman, all he knew about angling. Mr. Lansing was a most delightful companion and enjoyed good company, but it had to be the best in order to afford him any pleasure. He was extremely fond of poetry and had no end of quotations upon his tongue's end, and possessed the unusual faculty of being able to repeat from memory whole pieces, no matter how long they were, provided they awakened a responsive chord. Mr. Lansing, coming as he did from a military family, very naturally inherited military tastes, and shortly after the outbreak of the Civil war was appointed by the governor of New York chairman of the Senatorial Committee of his Senatorial District, which was composed of the following very prominent citizens of Buffalo: Nathan K. Hall, Stephen G. Austin, Jacob Beyer, John Ganson, Philip Dorsheimer, and Alexander W. Harvey. 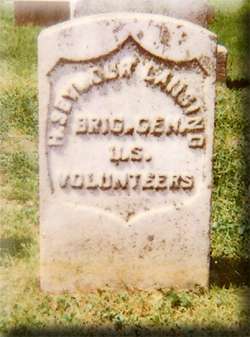 At this time Mr. Lansing was brigadier-general of one of the brigades attached to the Eighth Division of the State militia. Mr. Lansing served faithfully upon this committee and through its efforts Colonel Chapin's regiment, the One Hundred and Sixteenth New York Volunteers, and McMahon's Irish regiment, the Corcoran Guards, were organized, recruited, and sent to the front, where they did most excellent service. 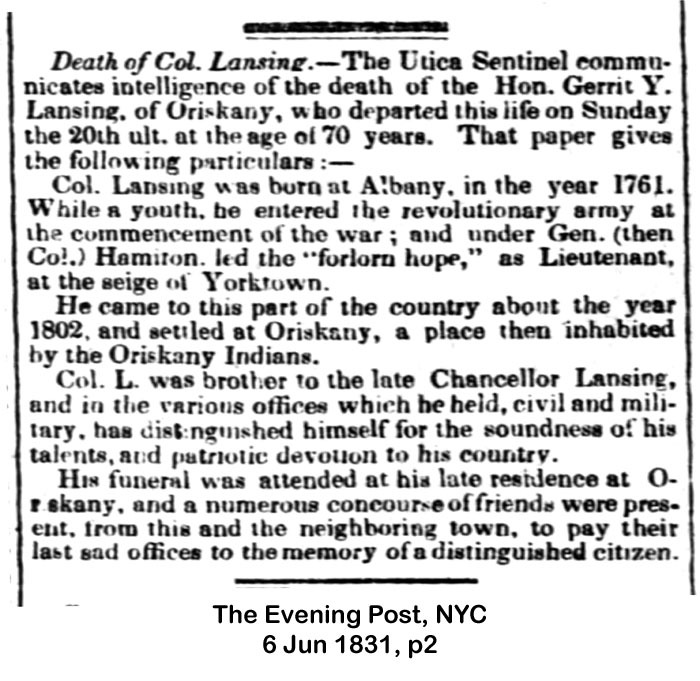 Mr. Lansing departed this life, after a tedious illness which he bore with great fortitude, at Canandaigua, on the morning of the 30th of September, 1889, and left him surviving a widow and two sons, Livingston and Watts Sherman Lansing. He was buried at Forestlawn Cemetery, Buffalo, N.Y.
[Henry Livingston Lansing, like his brother Henry Seymour Lansing, was active in the formation of The Military Association of New York. Colonel Henry Seymour Lansing, the brother of Henry Livingston Lansing, commanded the 17th New York Volunteer Infantry. 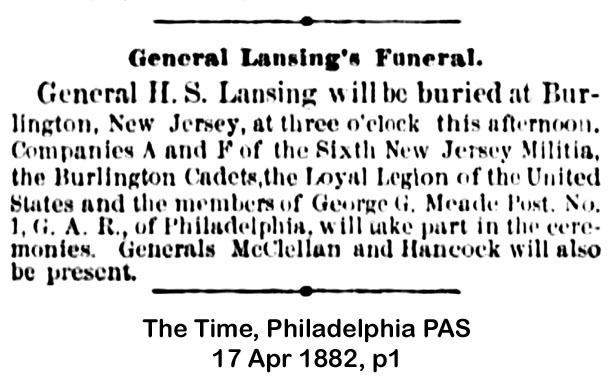 The regiment was formed on May 29, 1861 for a two year term and Colonel Lansing commanded it from its inception until it was disbanded on June 2, 1863. He, like his similarly named brother, had also been active in the formation of New York's Military Association before the war. Being surrounded by southern sympathizers, there was a great concern for the protection of Washington from the start of hostilities. Colonel Lansing's regiment was first assigned to that duty. 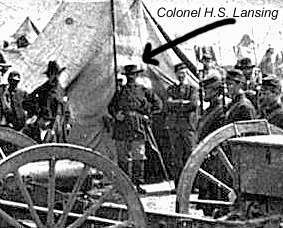 From April to May of 1861, Colonel Lansing participated in the Siege of Yorktown, the very place where his grandfather, Colonel Gerrit Lansing, had fought in the Revolutionary War. That summer, they fought in the Seven Days Battle before Richmond Virginia and by October, the 17th had been transferred to the Army of the Potomac and became involved in some of the worst Civil War battles, fighting with heavy losses at the second battle of Bull Run, Antietam and the Battle of Frederickburg and Chancellorsville. The first three of these battles is fictionally described in Gods and Generals by Jeffrey M. Shaara. 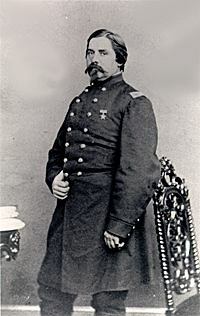 At the end of the war, Colonel Lansing was promoted by brevet to Brigadier General for his short command of the Bull Run battlefield. H. Seymour Lansing died 14 April 1882, and was buried in the churchyard of St. Mary's Episcopal Church, in Burlington New Jersey. HON. 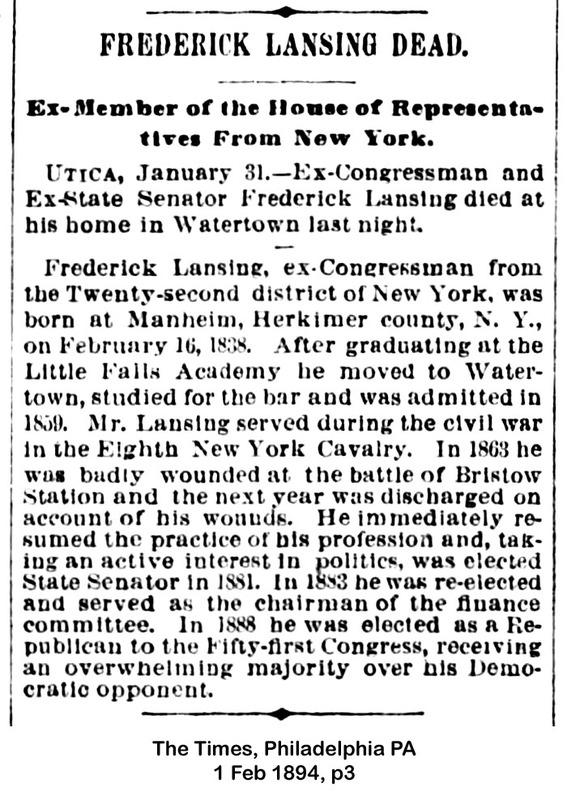 FREDERICK LANSING, formerly State Senator and member of congress, who died at his home in Watertown February 1, 1894, was born in Manheim, Herkimer county, February 16, 1838. He was the son of Hon. Frederick Lansing, of Herkimer county, who was a brother of Hon. Robert Lansing, so long and favorably known in Watertown. Frederick, Jr., was educated at the Little Falls Academy, from which he graduated when 18 years of age, and came to Watertown to enter the law office of Hon. F. W. Hubbard, being admitted to practice in 1859. At the beginning of the Civil War he enlisted as 1st lieutenant in Captain B. B. Taggart's company (K), 10th N. Y. Heavy Artillery. 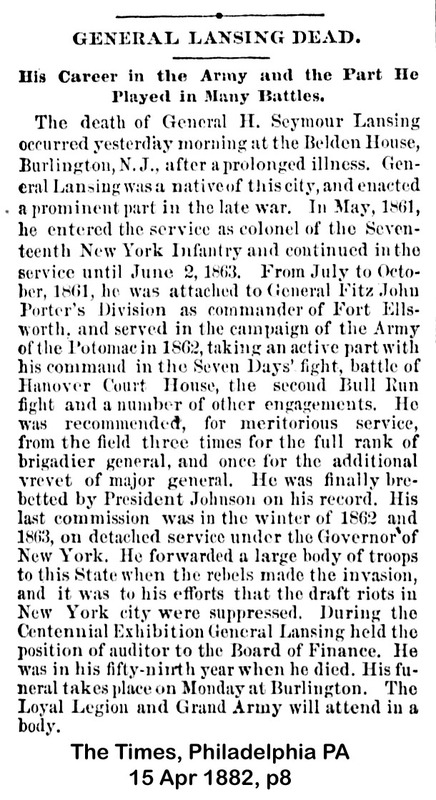 From this branch of the service he was honorably discharged in March, 1863, and in July of that year he was commissined as first lieutenant in the 20th N. Y. Cavalry, with which he was serving at Bristoe Station, Va., in October, 1864, when he received his wound, and was carried off the field in a blanket, the surgeon of the regiment not expecting him to recover. But he gradually convalesced, and became an important factor in the political, professional and social life of Jefferson county. "The death of Frederick Lansing comes close home to me. For more than 15 years my relations with him were of the most intimate and confidential character. Each shared the labor of the other, and its results. Each rejoiced in the other's successes, and deplored his failures. We never exchanged an unpleaseant word. My affection for him could hardly be less, nor my grief for his loss more, if united by a kindred tie. No words at my command can adequatley express my estimate of his character and worth. "As a lawyer, he was perhaps more of the ideal than the practical sort. He loved justice, and the science through which it is sought. He was well grounded in legal principles, and had a great familiarity with cases in the courts of our own State. It was rarely that one of importance could be mentioned with which he was not familiar, and he always seemed able to add a new light to any legal proposition submitted for his consideration. While he made no claim to preeminence in the argument of causes before court or jury, he nevertheless stated his reasons clearly and forcibly, interspersing them wilh sallies of wit or sarcasm that always secured the close attention of the hearer. He had little taste for the dry details and drudgery of a law office, and a detestation of the methods by which results are sometimes reached He never fomented strife, but discouraged litigation. He would have nothing to do with a cause, in the honesty of which he did not thoroughly believe, nor would he argue in favor of a legal proposition, however plausibly it might be done, which was not in accord with his own notion of the law. "I remember well a trial at the circuit, when the evidence disclosed conduct on the part of the client that he could not approve, that he deliberately withdrew, leaving the case in the hands of his associate, and at the mercy of the court and jury. When, however satified that his cause was just, he espoused it with his whole soul, and from thenceforth made it his own. In this he was no respector of persons. the washerwoman's case was cared for with the same fidelity as the banker's. "He leaves behind him no client whose fortune was wrecked by rashness or want of prudent management; who has not received all the fruits of the employment; or smarts under the recollection of an extortionate charge for his services. On the other hand, there are many who have received from him the labor of both lawyer and friend, without money or price. Their benedictions will follow him to his long home. "He was elected State senator two terms, and served one term in Congress. His services in the Senate began without previous legislative experience, but from the first he took a prominent position, and during his second term was chairman of the Finance Committee, and became a leader in the party. He bore an important part in much of the legislation of those two terms. Among the measures he inaugurated was one of special interest to this locality--the preservation of the Adirondack forests, which finally resulted in the creation of the forestry commission, forestry wardens, &c., as they now exist. "Mr. Lansing was in no sense a common man. His individuality was so marked that he was unlike any other. He imitated no one, was not a follower, was always respectful; yet I doubt if any man of his acquaintance was of sufficient lofty station to command of him any other consideration than could be accorded the humblest. He considered himself the equal of any man, and, though of a prominent family, conscious of his surroundings and what he was, he considered every other man the equal of himself. He was thoroughly democratic. He hated sham, hypocrisy and falsehood in every form; was absolutely honest, utterly unselfish and charitable to a fault, and he appreciated these qualities in others. His services to his country were heroic, his reward scanty, though in that respect his case is not exceptional. 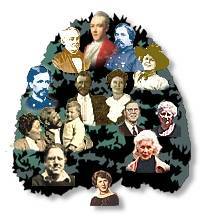 Mr. Lansing's near relatives are his widow, a daughter of the late George C. Sherman; his children, Louis G. and Miss Marguerite Lansing; his brother, Dr. E. S. Lansing, of Burlington, N. J.; two sisters, Mrs. Robert H. Boyd, of Newburg, N. Y., and Mrs. Milton A. Fuller, of East Bloomfield, N. Y.; his nephews, A. T. E. Lansing, Stewart D. Lansing, Charles S. Lansing, George C. Sherman and Frank A. Sherman and C. M. Sherman, of this city; and his cousins, Mr. John Lansing and Miss C. M. Lansing, of this city. A Representative from New York; born in Manheim, Herkimer County, N.Y., February 16, 1838; attended the Little Falls Academy, New York; studied law; was admitted to the bar in 1859 and practiced in Watertown, N.Y.; served during the Civil War in the Eighth New York Cavalry; acting adjutant of that regiment from June 23 to October 11, 1863; member of the State senate 1881-1885; elected as a Republican to the Fifty-first Congress (March 4, 1889-March 3, 1891); died in Watertown, N.Y., January 31, 1894; interment in Brookside Cemetery. Gettit Yates Lansing was graduated at Union college in 1800, studied law and was admitted to practice in 1804. He was clerk of the state assembly in 1807, a representative from Albany in the 22d, 23d and 24th congresses, 1831-87, and was elected regent of the University of the State of New York, March 31, 1829, and chancellor of the board of regents, Oct. 31, 1842. 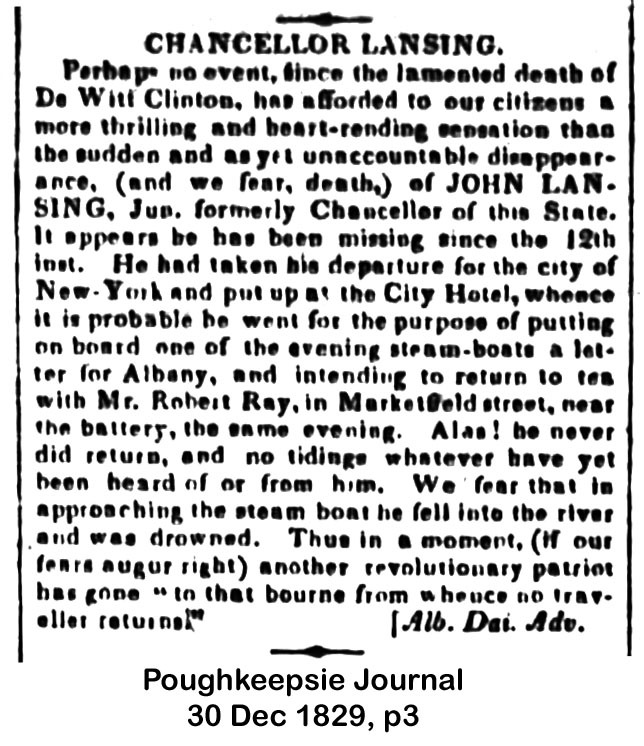 He died in Albany, N.Y., Jan. 3, 1862. A prominent lawyer and citizen of Albany, d. in that city Jan. 3, 1862; was judge of the State court of probates from 1816 until the office was abolished in 1823; was chosen a regent of the University in 1829; and for the last twelve years was chancellor of the regents; and from 1831 to 1837, was in congress. Gerrit Y., born August 4, 1783, died January 3, 1862; he held many positions of honor and trust in the city and county of Albany. He was in early life private secretary to Governor Morgan Lewis, clerk of the assembly, and judge of probate. He represented the district in the twenty-second, twenty-third, and twenty-fourth congresses of the United States. He was elected a regent of the State University to succeed ex-President Martin Van Buren. He married, May 31, 1808, Helen Ten Eyck. Sanders Lansing [brother of Gerrit G. Lansing and John Lansing], the great-grandfather of William F., was the first of the family to settle in what is now Herkimer county. He was born June 17, 1766, and his father's family became a distinguished one. His brother John was chief justice of the Supreme Court, chancellor, etc. Sanders Lansing married a daughter of Abraham Ten Eyck. He was a distinguished lawyer and was appointed register in chancery upon the promotion of his brother. He came to Little Falls in 1820, and had charge of several land agencies and in 1821 was appointed judge, which office he held until after 1828, the date of his last appointment. He was a man of lofty character and exceptional ability. His death occurred in the town of Manheim September 19, 1850. Sanders G. (the G. for Gerritse was only used when he was a boy to distinguish him from an uncle, Sanders Lansing), was born in Albany, June 17, 1766; educated to legal profession in Albany and Claverack schools; was register and master in chancery in Albany; removed from Albany to Little Falls in 1820; in 1821 was a delegate to draw up new state constitutions; 1821-28 was county judge of Herkimer county, New York; afterward supreme court judge; died in Manheim, New York, September 19, 1850; married, December 10, 1789, Catharine, daughter of Abraham and Annatje (Lansing) Ten Eyck. LANSING, SANDERS, b. in Albany June, 17, 1766; bro. 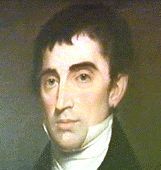 of John L., chief justice; he was educated to the law, and appointed register in chancery; in 1820, he settled at Little Falls, N. Y., in a land agency; was in the state convention of 1821; was a county judge until 1828, and held several other legal offices; he finally settled in Manheim, N. Y., and d. there Sept. 19, 1850, in his 85th year. Christian Intelligencer of the Reformed Dutch Church, Vol XXI, No. 1055 - October 17, 1850.